It seems that we (and when I say “we” I am referring to us photography geeks as a whole) simply love to talk about gear. I know I do. I have always viewed photography as a beautiful fusion of art and technology using these amazing instruments capable of controlling light to capture moments in print or screen. Images often say more, without words. People often ask “What gear do you need to shoot a wedding?” Well, the simple answer is “a lot.” To do it correctly, you need to choose the best lens for the shot. Some people use a single zoom lens the entire day. I don’t like that approach. You can’t really make a motion picture with one lens. You need to mix it up in order to create a certain mood or look. That’s my opinion at least. 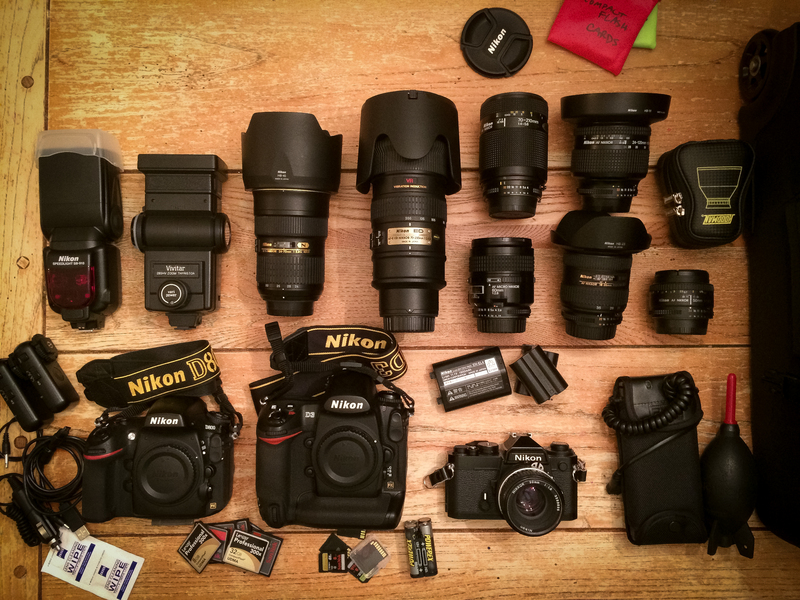 I use at least 4-5 lenses every time I shoot a wedding. I might use 3 to do a simple family session. Nikkor 17-35mm f/2.8 A workhorse lens. Nikkor 70-200mm VR f/2.8 Pure optical perfection. My favorite. Nikkor 70-300mm VR f/4.5-5.6 Great telephoto for longer reach. Nikkor 24-120mm f/3.5-5.6 AF-S VR Better than what pixel-peepers think. Nikkor 85mm f/1.4G The “Cream Machine.” Great portrait lens. Simply astounding. Nikkor 50mm f/1.8G Inexpensive, but classic. Nikkor 50mm f/1.8 ai-s Old manual focus lens. Nikkor 60mm f/2.8 AF-D Micro Macro lens. Nikkor 70-210mm f/4-5.6 AF-D Back-up telephoto lens from 1980s. 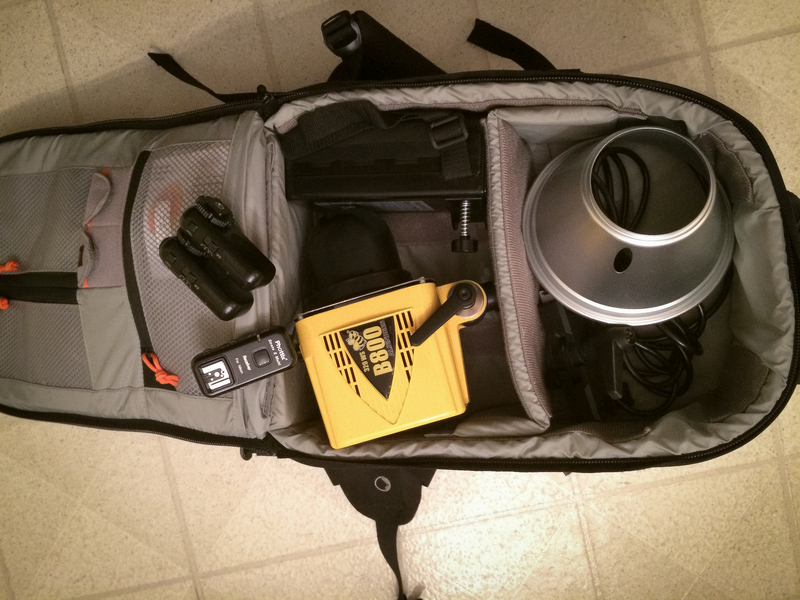 If I need to use a studio strobe, I take my lighting bag, which has an Alien Bees B800 320 watt strobe and Lithium Battery Pack. I use a large Paul C Buff Soft Box all mounted to a Manfrotto light stand. It is a simple set-up for portraits in the field. If I need another light, I will just use the Nikon SB-910 with a diffuser. Hi, I loved your post about the D3 getting dragged by a car. I shoot Nikon, with a D300; I’m one of those amateurs who occasionally sells photos. On the computer side, I have a very similar setup but one thing made me curious: you use Aperture rather than LIghtroom. Why is that? I haven’t used Aperture in a long time; I tried it when it came out but I’d had Lightroom since the beta and stayed with that. If you have time sometime, I’d love to know what Aperture does that you like. EDIT: Made the switch to Lightroom since Apple has scrapped Aperture 3. So far, I am liking it more once I have had to work with it every day. I love Leica, but I am moving more towards Nikon. I shoot weddings and portraits. If I win the lottery, I will own both systems! Hy there where is your leica gear ? Do you still have the M3 and what lenses ?